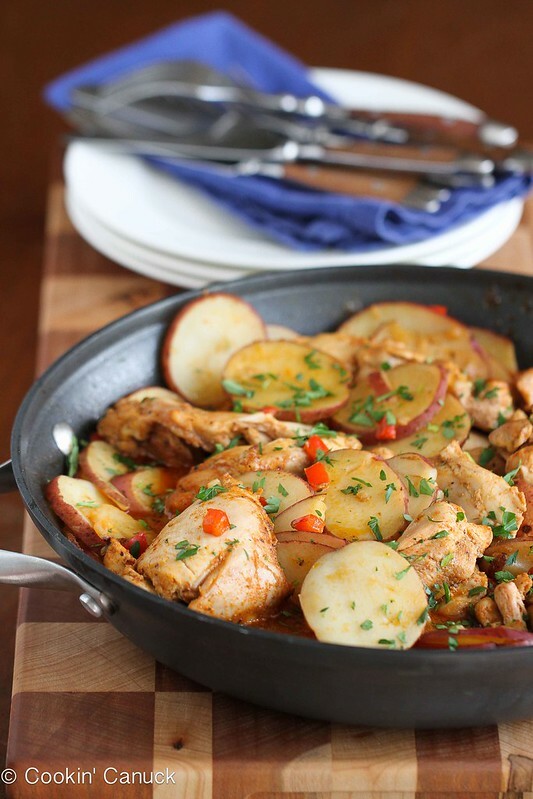 Today is a big day for my youngest son (T), and it’s appropriate that I’m posting this one-pot chicken and potato recipe, one of his favorite dishes. Today is T’s ninth birthday and, little does he know, but he has a big surprise coming his way this afternoon, something that he has been wishing and begging for over the last two years. So has my older son (M), for that matter. Now it’s going to be his room. His bed will be tucked in the corner, with a new alarm clock sitting on the bedside table. There will be a cool Bruce Lee poster hanging on the hall for my kung fu-loving boy, and a new striped rug on the floor to brighten things up. We’ll set up his dresser and bookcase along the wall, decorated with T’s kung-fu trophy, rock collection and prized Lego battleships. 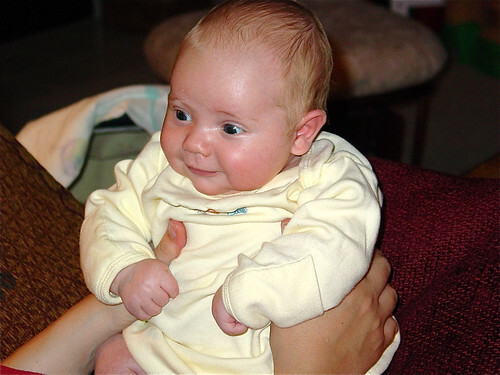 T as a bright-eyed baby. Of course, Steve and I are excited for T, but there’s a small part each of our hearts that aches. For 7 years now, M and T shared a room, one on top of each other in their bunk beds. Listening to them whispering to each other at night, sharing experiences and stories, was such a joy. And now this will just happen on special occasions, when they decide to have a sleepover in one room or the other. But we know it is time for this rite of passage. M is heading off to middle school next year and they are both yearning for a little privacy, a space to call their own. And so Steve and I will swallow our stifle our sadness, and rejoice with T as he crawls under the covers of his bed….in his own room…as a big 9-year old. M & T, our two boys. Happy Birthday to my sweet and funny boy! This is a recipe that I’ve been making for years. I adapted it from a Cooking Light Magazine recipe that, changing up the spices and proportions to fit our family. It’s one of those recipes that I make when I’m stumped for a new idea because I know it’s going to be a hit, and the ingredients are usually in my freezer and pantry. (this is my Amazon affiliate link for the pan) and let it simmer until done. I truly use this pan at least 4 times per week. In a small bowl, combine cumin, smoked paprika, brown sugar, coriander, 1/2 teaspoon salt, pepper, cayenne and 1 1/2 tablespoon olive oil. Rub the spice mixture over the chicken thighs. Set aside. 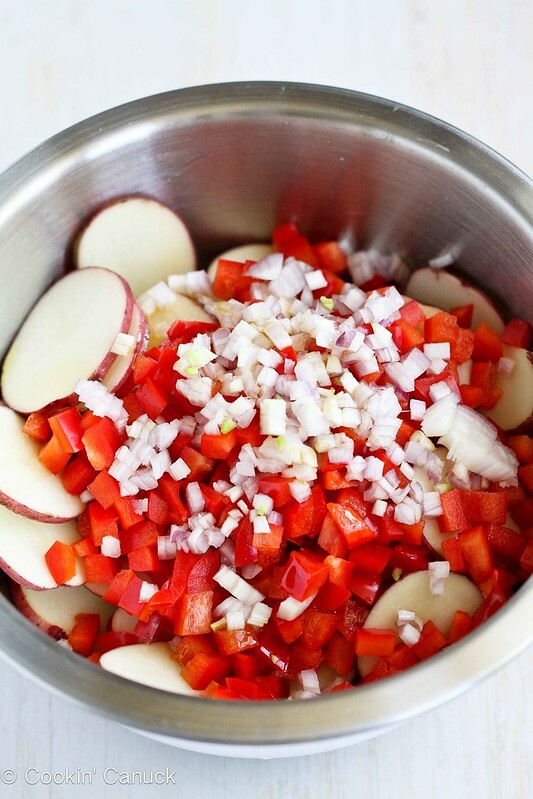 In a large bowl, combine potatoes, 1/2 tsp salt, red bell pepper, shallot and 1 tablespoon olive oil. Heat a large nonstick skillet over medium-high heat. Add the potato mixture to the skillet and cook for about 5 minutes, stirring occasionally. Add the chicken broth, cover the skillet, reduce heat to medium-low, and simmer for 5 minutes. Uncover and nestle the chicken thighs into the potato mixture. Cover and cook for approximately 20 minutes, or until the chicken is cooked through and the potatoes are tender. Sprinkle with the parsley. Serve. In a small bowl, combine cumin, smoked paprika, brown sugar, coriander, ½ teaspoon salt, pepper, cayenne and 1½ tablespoon olive oil. Rub the spice mixture over the chicken thighs. Set aside. In a large bowl, combine potatoes, ½ tsp salt, red bell pepper, shallot and 1 tablespoon olive oil. How exciting for T! What an awesome birthday gift! Hope you guys have a great day! These potatoes are calling my name!! I love all the spices! YUM! What a fun surprise for him, and I’m sure he’s going to be excited. Both your boys are so sweet (gee, I wonder where they get it from?) I love the photos in this post! And this recipe looks like a total winner for an easy family dinner! Happy Birthday to T! This is a great weeknight meal! I’m all about the cumin, this looks lovely!!!!! Happy Birthday to the boy! And this one-pot business has me weepy. Awwwww! I bet he’s going to love having his own room… what a lovely birthday gift. Oooh, happy birthday to your boy! And what a bittersweet moment. It’s so great watching them grow up, but so hard at the same time. And this meal? Want! awe happy birthday to your son! this one-pot meal looks divine!!! Happy birthday to T! Hes so cute!!! Happy Birthday to you big guy! This looks like a wonderful meal. Both your boys are blessed to have two geat parents. Enjoy your posts and recipes. The only change I anticipate making to this one is to brown the thighs in the skillet first. Then set them aside and proceed with the recipe as given. It also lookslike an easy recipe to half. Yay! Happy Birthday to the big boy! And this one-pot chicken dish must be actioned! I absolutely love one-pot meals! Less clean-up is always a plus! Will be trying this recipe soon! Your boys are so cute! Sounds like they will be so excited for their new rooms! Happy B-day T! Happy Birthday to your sweet son Dara; he is so cute! I just love cumin and it’s a love that has come about later in life so I’m hungry to use it as often as possible. Sounds terrific; a must make. Happy birthday to your son!! This recipe looks amazing! I live for one-pot wonders like this! Such a yummy looking recipe. Happy birthday to your sweet boy, Dara! Hello there, I bet I’ve stumbled upon your blog several times and have always gazed at the amazing posts and pics. What a beautiful blog and so well written. I specially love your weightloss feature….so inspiring and definitely proud of you! Happy b’day to your 9 yr old and that dish looks scrumptious! Wow, reading this gave me goose bumps for goodness sakes, what is wrong with me. I’m an emotional wreck since turning 40 🙂 Great story and I hope T is blown away by all of the cool stuff his mom and dad do! 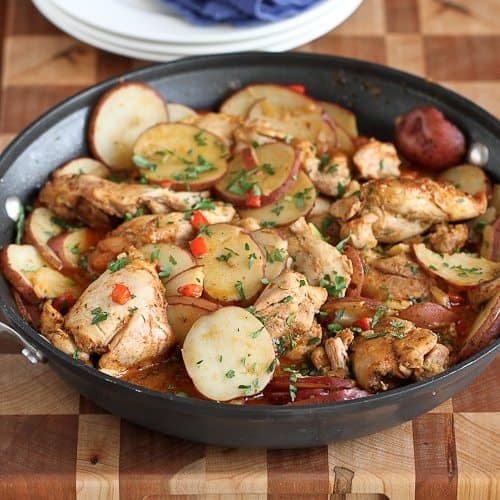 Would boneless/skinless chicken breasts work well with the One-Pot Cumin & Smoked Paprika Chicken with Potatoes? I’d love to make this but my husband prefers chicken breasts. I know just how you feel. We moved my two sons to seperate rooms early this year and it was a heart tugger. You’re happy they’re blossoming as individuals, but can’t help hating to see the years fly by. Happy borthday T! I honestly don’t know where to start… with your adorable children (Happy, happy Birthday T! 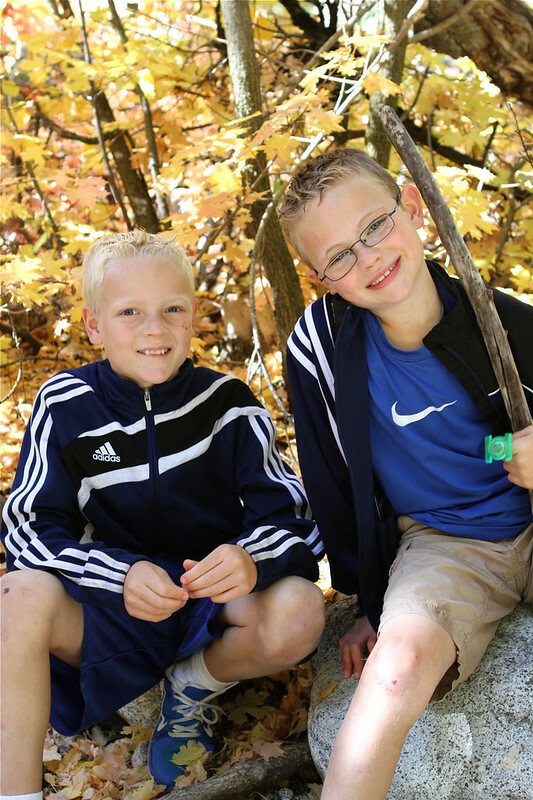 ), commiserating over boys growing up (mine are 20 and 17 – YIKES!!) 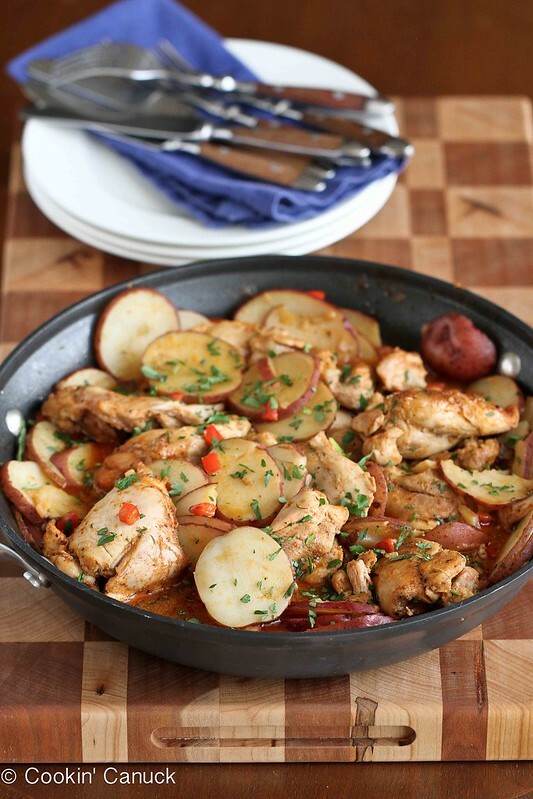 or licking my chops over that fabulous chicken and potato one dish meal – which BTW are one of my ALL TIME favorites – seriously cannot wait to make this! Gorgeous kids, gorgeous photos and a wonderful story!!! Happy birthday to T! Absolutely love the flavors in this dish! Happy Birthday to your son! This looks great, but have you ever made it with chicken breasts instead of thighs? We are more of a white meat chicken family. Also, I really like how you sliced those potatoes. I’m gonna have to give that a try. I’m more prone to cubing but I like this! This looks really delicious. I really need a new recipe to try and this looks like something I can handle. Is there a huge difference in smoked paprika and paprika? Happy birthday to T! The chicken looks really good! 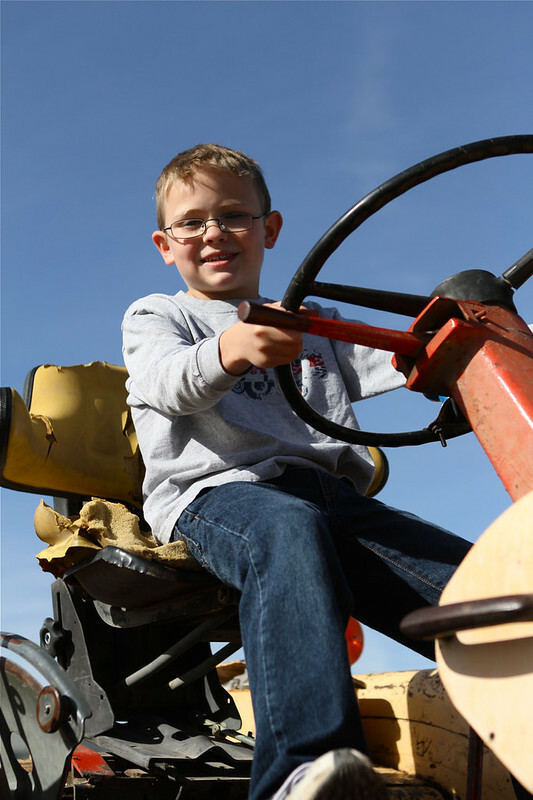 What a great post for your son–and a tasty-looking recipe as well. I like how everything cooks together–I bet the flavors are wonderful. Thanks! My heart just twitterpated (wait, was that from Bambi? What movie was that?) when I saw that huggable cutie in first couple of pictures. Oh my goodness, my heart aches at how fast it goes by! I can just imagine how thrilled he was to move into his big boy room, but totally understand how it must have been bittersweet for you guys, too. 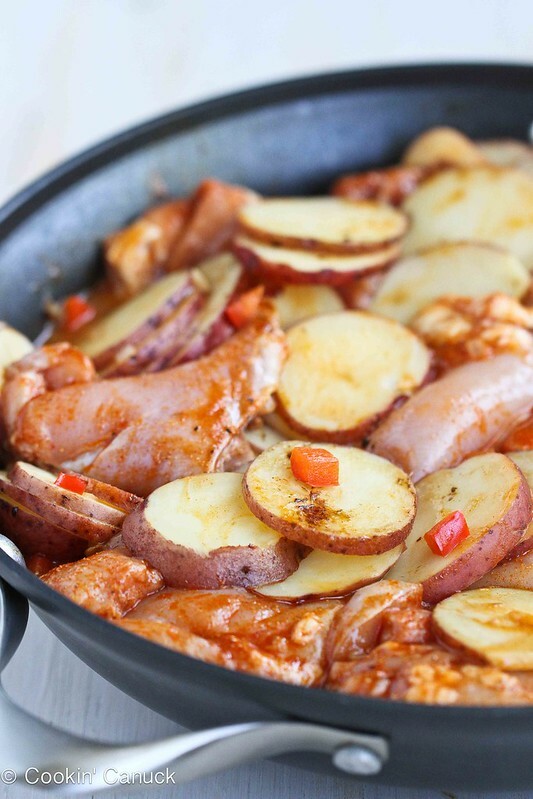 Love this one pot dish – I’ve been craving potatoes a lot lately, this sounds so good to me! Such a neat story that by the end I couldnt even remember what you had made. I just went through that with my kids. Its so hard and even harder to admit when they get old. I hate it. But just as much as I hate them leaving one stage its exciting to go through the next. You had me at one pot! This paprika chicken sounds awesome. And his own room?! How freakin rad is that! I remember how big a moment my own room was. ;D Happy Birthday to your boy! I hope your son’s birthday was all he (and you) hoped for! I made this tonight – it was a hit with the entire family. Thanks! What handsome young men you have! It’s like you blink and they are so big, they grow so fast. Love this hearty meal and the photos are gorgeous. Happy Birthday to T! The kids grow up so quickly don’t they. Love this one pot meal – smoked paprika is one of my favorite spices – definitely going to give this a whirl Dara. Awww, that is so cute and exciting! I have a nine year old so I am at the same stage with privacy and such but he is an only child so it’s more to do with me wanting to snuggle and kiss on him and he not wanting to so much. That recipe looks de-lish. Going to show the cooking boyfriend the recipe! Happy birthday to T! Love this recipe–I’m obsessed with cumin. Give me anything with smoked paprika and only one pot to clean! Looks delicious, Dara. Dara, I totally remember when I finally got my own room. I had to of been around the same age as T. I’m sure he was so happy!! Thanks for sharing this one pot meal as well. I’m putting it on my menu for this week! Hi there, not sure where I went wrong with this recipe. It looks amazing and I love a good one-pot recipe but the flavours just weren’t wow enough for me. A bit too bland. This is such a sweet.sweet post. These are the moments and memories that I hope to experience and treasure as I pray daily for our lil’ miracle. I hear kids grow up very fast and that you should treasure every single moment. As someone who’s always trying to be a step ahead (I’m working on changing this about myself), this will be quite a challenge. Happy birthday, T! Your have a beautiful smile ;). As for this recipe..my husband’s fork will be all over this! Can’t wait to make this for him soon. He’s been good to me..he always is ;). This is a dish that I will be making for the 4th of July, thank you for sharing. 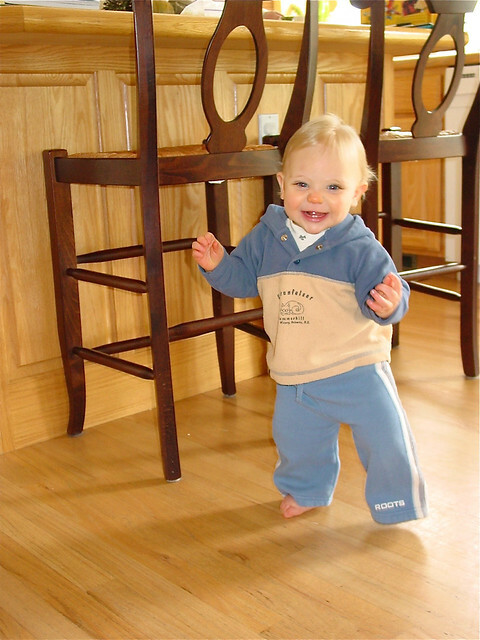 I also want to mention Happy belated b-day to T. That picture you of the baby taking first steps is too cute, love it!! Just made this dish as a quick meal cause I had all the ingredients in the house. Flavour is good, preparation is simple and it even worked with bone in chicken thighs. Will definitely be making this one again. Thanks! Jeniece, I’m so glad you enjoyed this. It’s a favorite dish at our house, and it’s great for a weeknight meal. Just made this dish exactly to recipe. To be honest, I was disappointed-the only flavor that really came through was the coriander , otherwise very bland. The brown sugar, paprika, and cumin get lost in the dish. Emy, I’m sorry to hear that you didn’t enjoy this. This recipe is always a big hit with my family and guests we’ve served it to. Typically, I find that the smoked paprika (please double-check that you’re using smoked rather than regular paprika) is the most dominant flavor. Another suggestion…make sure that your spices are fresh and kept in a cool place. Spices that have been sitting around for awhile (and believe me, I’ve done that many times) tend to lose their potency. I made this yesterday and I loved it! I’m sure this will become a staple in my kitchen. hi there – this looks delicious. do you think boneless skinless chicken breasts would work? maybe cut them in half to be the same size as thighs? any difference on cooking time? thanks! Hi Michele, I’ve never used chicken breasts in this recipe, but I’m sure it would work well. Yes, I would cut them in half as you suggested. The cooking time will likely be pretty close, maybe a little shorter. Just be sure to check along the way so that the chicken breasts don’t dry out by being overcooked.